Luis Barrios speaks with reporters at the state Capitol complex in Hartford. 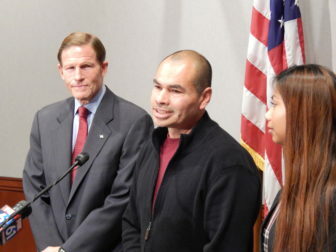 Sen. Richard Blumenthal, left, and Barrios’ daughter, Jessica, right, stand behind him. Federal immigration officials have granted Luis Barrios, a Guatemalan native who has spent decades living in Derby, a two-year stay of his deportation, giving him ample time to formally pursue asylum in the United States. His reprieve may prove to be an outlier under new Trump administration deportation policies, however. Barrios, who came to the United States as an undocumented immigrant in 1992 after fleeing violence in Guatemala, had been identified for deportation under new Trump administration policies. Federal officials were set to deport him on May 4, but he was granted a 30-day stay of the deportation the day before. The news was announced at a press conference in Hartford organized by U.S. Sen. Richard Blumenthal, D-Conn., who has been one of Barrios’ strongest advocates. While the latest reprieve is not permanent, it gives him “two years of unfettered relaxation” as he pursues asylum, O’Neil Baker said. Barrios has received support from numerous state and federal lawmakers in Connecticut, and his case has been widely covered in the media. Blumenthal said his staff made a “full-court press” to ensure Barrios would not be deported.